But what are we to make of such an absurd supposition in Edelstein's exercise, that the flotilla volunteers ( many of whom are women and elderly ) will be armed and dangerous, and intent of attacking the IDF? We have seen repeated statements from the Flotilla organisers reassuring the Israelis that the Flotilla is a peaceful humanitarian mission that has no combative intentions, and the media have been invited to visit the boats to verify the innocent nature of the Gaza bound cargo. What is it then? Why are these Israelis preparing for a war? The answer is clear and simple: as I have explored in the past, Jewish identity politics is shaped by a totally unique psychological disorder. I call it Pre Traumatic Stress Syndrome (as opposed to Post Traumatic Stress Syndrome). Jewish reality is shaped by an imaginary fictional future threat. To repeat the 19Th century Yiddish joke. “A Jewish telegram: get worried, details to follow.” Yet, the lack of capacity to differentiate between reality and imagination leads to the inevitable emergence of the most tragic possible scenarios. Time after time, the Israeli collective easily buys into any given tragic fictional and imaginary treat, and would approve any 'counter' measures. The end result is known to us all: an endless chain of colossal Israeli war crimes, that are committed in the name of the Jewish people. Brilliant isn’t it? The peace activists (most of whom, remember, are women and elderly) ‘opened fire,’ seeking a battle with the best and most lethal Israeli commando unit. How realistic is that ? Then, as the imagined scenario unfolds, a fierce battle develops, in which just fourteen activists are wounded, and only one dies. At this point, for those who fail to remember what really happened last time around, here is video footage of Israeli commandos executing peace activists on the Mavi Marmara. 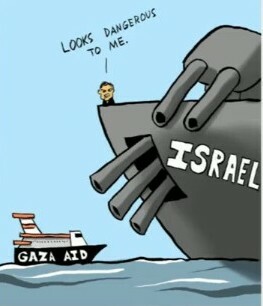 But Minister Edelstein is far from being worried: after all, the Israelis have friends around the world. “As the events were taking place,” the scenario continues, “the media – with emphasis on the Internet, Facebook and Twitter – were flooded with mendacious reports (by private users, Hamas and others among Israel's enemies). The situation room, in coordination with the IDF Spokesperson and the National Information Directorate, began to disseminate credible messages to Jewish communities and friends of Israel around the world. Those in the situation room responsible for new media began to update messages on the social networks, Facebook and Twitter. For those of us who still fail to recognise the shifts and changes that have taken place within Zionism, Edelstein makes it clear: whilst Zionism was initially a plan to re-settle the Jews in Zion, nowadays, to be a Zionist means to stay in the Diaspora, and to 'tweet for Israel'. The role of American, French and British Jews, according to Edelstein, is to coordinate with Israel, and to join the Hasbara war: "Given the provocation by the flotilla,” says Diaspora Minister Edelstein, “we established a special situation room that will ensure coordination between Government officials, Diaspora Jewish communities and friends of Israel around the world.. I am certain that alongside us will stand significant force multipliers in the form of thousands of activists from Jewish communities around the world." I do not have any doubt that many Jews around the world want nothing to do with Minister Edelstein and his Hasbara initiative. They are clearly going to ignore his call. I also feel sure that many Jews feel sickened and ashamed to wake up, all too often, into yet another atrocious Israeli war crime. Yet, if the Israelis themselves clearly regard Diaspora Jews as their ‘foreign brigades’, surely we should also be allowed to look into the issue, and examine the lethal continuum between the Jewish State and its vile supporters around the world.